I have a Dbot corexy with one z motor, 4 regulation screws bed 300x300 , bltouch with mesh leveling enabled. Is there a better way to obtain a leveled bed> for example would be an improvement switch to 3 z independent Z motors? Or switch from 4 point to 3 point bed screws? In other words, what would be the state of the art of bed leveling ? however with 1 motor driving the 4 screws there should be no tilt after initial leveling, since all lead scews are connected. do you have tilt over time? The printing bed is regulated by 4 screws. I read the wiki but I am wondering which system is the most effective and rock solid in real use. it really comes down to looking at the tilt over time. look at the height map. see where the lead screws are. do they need to be adjusted after a certain time to make the bed more level. On my corexy, I have two leadsrews driven by a stepper via a belt @ 2:1. The bed uses 3 screws to mount to the bed frame. Haven't had a problem with the bed holding it's level. .......................... In other words, what would be the state of the art of bed leveling ? IMO the state of the art is to have a level bed that never needs to be re-levelled, and to achieve that is neither neither difficult nor expensive. 3 points define a plain, therefore 3 screws, evenly placed in a triangle will raise and lower that plain without imparting any twisting forces so the bed will stay flat. Obviously the lead screws need to be in perfect synchronisation so the best way to achieve that is to drive them via a single motor and continuous belt. Initial levelling is done by slackening the pulleys on the screws, then adjust two screws in relation to the third. If designed correctly so that none of the screw or bed mounts can warp or twist, then the bed will remain level. At a conservative guess I'd say that my printer runs about 20 hours a week on average sometimes less, sometimes very much more so at least a 1,000 hours a year for the last 4 years. The bed level was adjusted when it was built and about a week later after things had settled in. Since then, it has needed adjusting on only two occasions and both of those occasions involved partially dismantling the printer and transporting it to another location. The last time it needed adjusting was when I returned from exhibiting at the TCT show in September 2017. I'd say that is "state of the art". If you're building something to make impressive youtube videos, or you want to see just how low-end you can get with mechanical construction and still make a functioning printer, go with 3 independently driven lead screws that automatically level the bed before each print, and bed mapping to compensate for a bent piece of sheet metal used for the bed plate. My corexy printer's Z axis has two belts driven by a single motor and a 3 point kinematic mount for the 300x300x8mm cast tooling plate bed. The only time it has to be releveled is when I take apart the Z axis to make modifications. It's a tall printer and I transport it laying on its back in my car. I've done that many times - just stand it back up and start printing. The difference between the two approaches is where you want to spend your time and money. The first method requires more electronics and motors, and more time to set up and debug. The mechanical approach requires more solid construction and access to tools you might not have. I don't use any leveling system at all, I shimmed the bed into alignment by individually adjusting stainless steel spacers with sandpaper, and it has never moved since. This system is the heaviest (and maybe also the most expensive), but if you find yourself constantly adjusting and probing the bed you have to wonder if other alignments are shifting as well. ok so the 'trending answer it raise from this discussion is the best leveling system is the one that is not needed. So there is a second question that arise. which is the best bed and how to connect to the frame? I have the simplest solution . 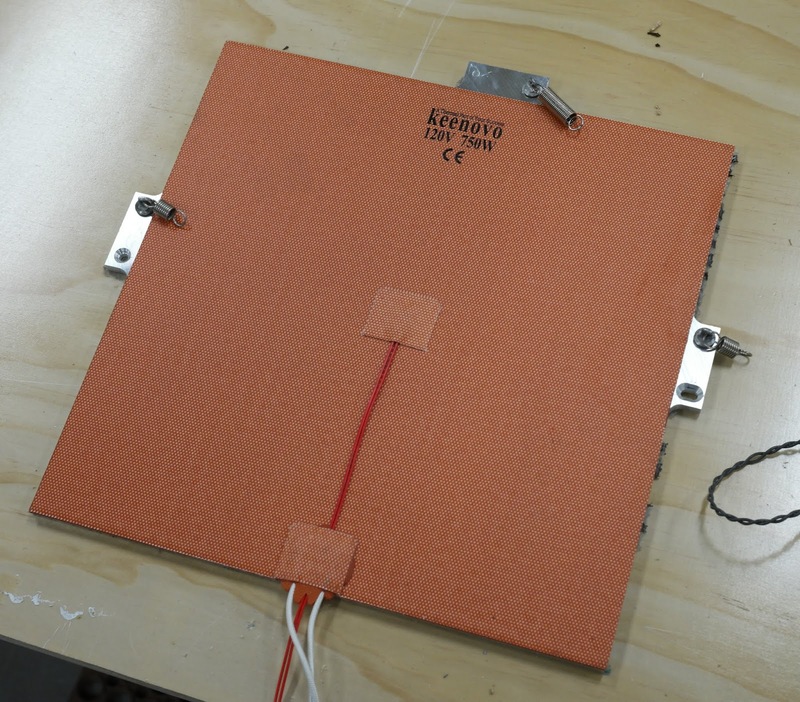 MK2 heated bed fixed with 4 adjusting screws on the frame with glass over it, it works but isnt perfect. 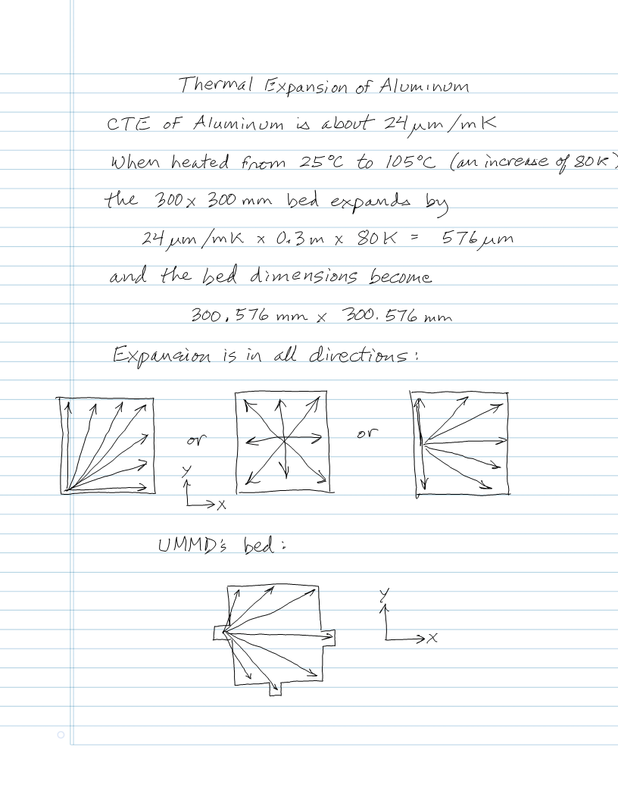 I am afraid about aluminum bed for 3 reasons cost, availability and thermal reaction. Can you post your solutions? Aluminium tooling plate is the best solution because the bed needs to be flat, and it needs to be stiff enough, and it needs to have good thermal conductivity. This question gets raised with monotonous regularity. the question raises with monotonous regularity maybe because the answer is not as clear as you think. You can find many opinions saying glass is the way to go same for the opposite. in my experience no big sticking problem capton tape , blue tape , or hair spary , I never had adhesion problems. So you can say , "so why don't you stick with your glass bed and stop bugging us if you alredy know the solution//"
The main problem , in my experience with glass, is how to connect glass to the frame? Can i ask you where you sourced your aluminum bed and how much does it cost? @claustro I think you misunderstand. The aluminium forms the bed structure and also acts as a heat spreader. You can put your preferred print surface on top of that, whether it be glass, PEI sheet, Kapton tape, or some other exotic material. Attaching a heater directly to glass is a bad idea because of local hot spots, and because glass is fragile - especially if it is unsupported. A search for "aluminium tooling plate" should turn up a local supplier. BTW, I use 6mm un-toughened float glass glass on top of my 10mm thick aluminium plate, with a mains powered silicone heater stuck to the underside of the aluminium. Glass is a print surface, not a bed plate (at least it shouldn't be). A 3 point mount is stable, like a tripod. When you turn one leveling screw, the whole bed plate tilts on the other two screws. A kinematic 3 point mount allows the aluminum plate to expand and to be set in tram with the XY plane of the printer without causing anything to bend or flex. Notice the reference hole on the left and the slot in the right ear. The chamfer prevents lateral motion but allows the plate to tilt on the spherical head screws for leveling. As the plate expands the slot slides on the pitch screw head in the X direction (in this case). The roll screw contacts the smooth underside of the plate which is free to expand in X and Y at that location. The roll screw tilts the bed on the other two screws. Springs hold the plate down on the leveling screws. I'm partial to PEI as a print surface but there are plenty of other options. PEI is glued to the aluminum so there are no clips or clamps to bang the extruder into. I have to wait for it to cool off before removing prints, so it isn't for impatient or high production users. I'm happy with my cast aluminum beds supported by four adjustable screws. Yes three is fine but I prefer four. It only takes a couple of minutes to run the macro that allows me to check all four corners of the aluminum plate and make any needed adjustments. Not high tech but it has proven to be reliable and stable. thank you all for the answers , my first cartesia printer , believe it or not, has a glass bed connected to the y with glued supports. @deckingman thank you for the supplier link I'll check it out. Isn't in your solution the weight a problem? Can i ask you the power of you heating element? I have difficult to perfectly understand your bed mount . left and right are for regulation screws.upper one is the reference .right? how about the force through the Y direction? Do you think your system could be fitted in a corexy D-bot? Weight isn't a problem - in fact a heavy bed that does not have to move in the Y direction, is an advantage because it makes the printer more stable. It only moves in the Z direction so apart from homing, it only ever moves by the layer height which is a very short move. A single Nema 17 motor is more than adequate with the fine lead screws that I use. The bed uses a 10mm thick x 400mm x 400mm aluminium plate and I use 6mm thick glass on top and an 800 Watt mains powered heater. If I was starting again I would probably use an 8mm thick plate. The heater is somewhat over powered but I prefer the faster warm up time that gives me. The underside of the aluminium is insulated for the same reason. In the third photo, the upper ear is the roll adjust point. The left ear with the chamfered hole is for the reference adjuster, used to set the height of the bed, and the right ear with the chamfered slot is for the pitch adjuster. I chose the left edge for the reference point, and put the reference screw there. When the bed expands, the direction of expansion at the pitch support point is in the X direction only, so the slot is parallel to X. That allows the bed to slide on the pitch screw's head. At the roll screw, the plate is flat and can slide on the screw in X and Y. Reference and pitch adjusters are turned through holes in the bed plate, the roll adjuster is tweaked from under the bed. I put this type of bed in my coreXY machine and in another printer that moves the bed in Y, so there's no reason it couldn't be put in a D bot. The reference and pitch levelers don't have to be at the center of the edges of the bed- they can be put along the edge opposite the roll adjuster. I put them at the center because I wanted them located close to the Z axis linear guide bearing blocks. Leveling is super fast and easy. When you turn one screw, the bed plate tilts on the other two, so the easiest way to level is to adjust the pitch first. Once pitch is dialed in, adjusting roll doesn't affect it. If I do work that requires me to take the Z axis apart, I use the manual bed leveling assist in RRF to reset the bed to level. If I don't take the Z axis apart, I don't have to touch the leveling, even if I transport the printer laying on its back in my car. Something like this could work ? Worth change from printed bed support to aluminum one? When you talk about 3 screw autolevel are you talking about 3 indipendent motors for Z axis? can you give me more info regarding your printer?